Very few images, and none of them authentic (apart from her likeness in the ring her daughter Elizabeth I wore for her whole life), of Anne Boleyn survive, so it is very difficult to say what the second wife of Henry VIII looked like. We have to rely on descriptions written around her lifetime, but these are often so contrasting that it's impossible to believe they refer to the same woman. Some say she was beautiful, others that she was only average-looking and some describe her as a monster. Who's right? In his biography, The Life and Death of Anne Boleyn, Eric Ives quotes a couple of sources claiming Anne was a beauty. John Barlow, one of her clerics, said that she was "gracious, and reasonably good looking”, while Lancelot De Carles, a French poet who became Bishop of Riez, mentioned she was "beautiful and with an elegant figure" and praised her eyes "always most attractive which she knew well how to use with effect. Sometimes leaving them at rest and at others, sending a message to carry the secret witness of the heart. And, truth to tell, such was their power that many surrendered to their obedience." Not everyone had such praises for her looks. Francesco Sanuto, the Venetian diplomat, described Anne as "not one of the handsomest women in the world; she is of middling stature, swarthy complexion, long neck, wide mouth, a bosom not much raised and eyes which are black and beautiful." It is important to remember, though, that the ideal Tudor woman had angelic looks, with porcelain skin and blue, or green, eyes. Therefore, it is not surprising that many at the time believed Anne to be too "dark-looking" to be a real beauty. It is very unlikely that this description is true. First of all Sandler contradicts himself. He mentions six fingers, a wen, a protruding tooth and then finishes by saying Anne was handsome to look at. How could this be? Sandler was a Roman Catholic, and as such an enemy of Anne, whom he had never even seen (he wrote, in exile, during the reign of Elizabeth I). So, this description is just an attempt to blacken Anne's reputation. This flaw must have been insignificant or Thomas Boleyn, Anne's father, would never have sent her to serve Margaret of Austria, Queen Claude of France, and Catherine of Aragon. He would simply have kept her locked away at their house. There is also no way that a deformed Anne would have caught the King's eye and kept his interest for so many years. Not to mention that any deformity, at the time, was seen as a mark of the devil. Henry VIII would have never pursued a woman who had signs of being a witch and who could pass any defect to her (and his) offspring. 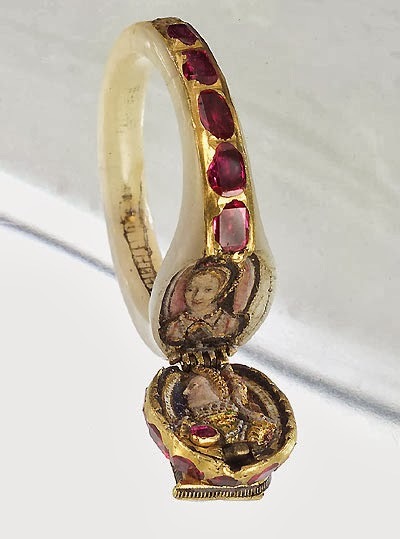 As I mentioned above, the only authenticated image of Anne Boleyn is the one housed in her daughter's enamel ring. It shows a woman with a long oval face, high cheekbones, a strong nose and a pointed chin, all traits Elizabeth I inherited. So, what did Anne Boleyn looked like? 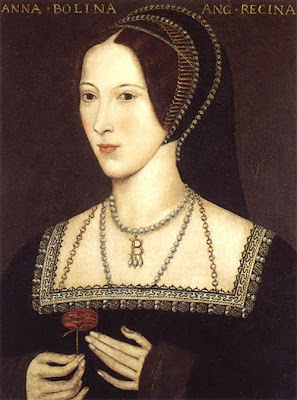 I don't believe that Anne Boleyn was a great beauty, but she wasn't ugly either. She was a pretty girl, but it was her wit and intelligence that really charmed people and made her stand out among the more submissive and angelic-looking beauties of her age.